The topic of living a “clutter-free” lifestyle isn’t a new one around here. I’ve been through several downsizing/minimalism phases, each one varying in severity and longevity, and bits and pieces of my journey are littered throughout the online pages of this blog. Getting rid of stuff, it seems, comes and goes in trendy waves. I’ve ridden several and, I hope, crossed over into a balanced lifestyle of intentionally living with less without the guilt or restriction I once felt about the label “minimalist”. (A label I don’t subscribe to, by the way). 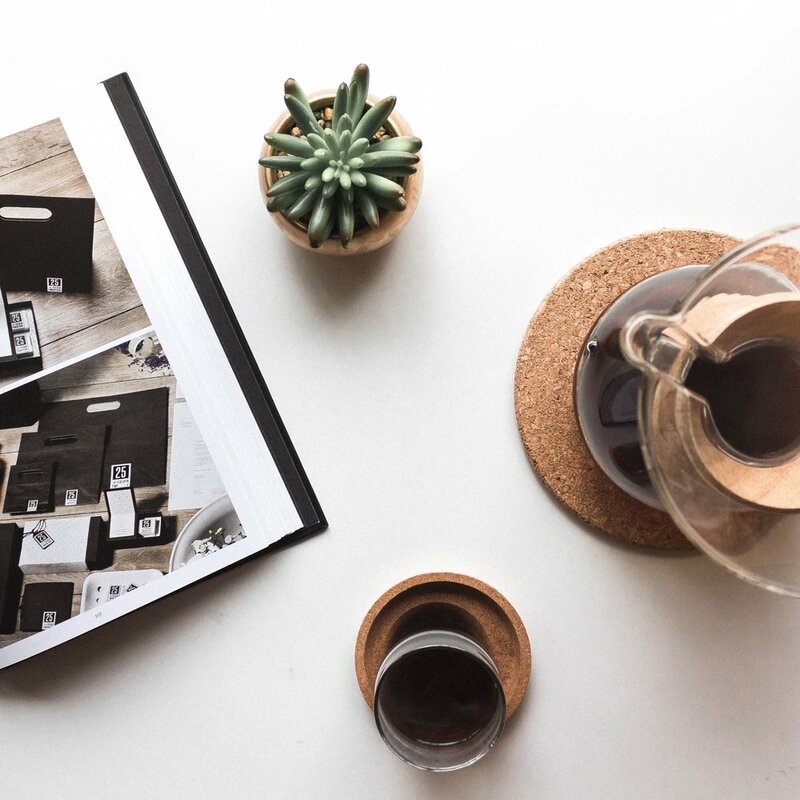 With the recent success of Netflix’s rendition of Marie Kondo’s not-so-new method of tidying up, it seems minimalism is on another trendy high, with folks all over the world declaring which items do and don’t spark joy in their lives. I love lots of things about Kondo’s method, especially the subjectivity, but one thing I’m hesitant to love about this “mass exodus” of ex-hoarders into minimalist territory is the sheer amount of waste that’s bound to be created, despite the KonMari warnings to dispose of things mindfully. It’s inevitable, somewhat, creating waste initially when you begin to live a more conscious lifestyle. But I think it’s possible to Marie-Kondo your life without throwing all of your non-joy-sparking possessions into a landfill. This blog post could go much more in depth, but, for sake of time and practicality, here is my quick two cents on how and why to de-clutter as mindfully as I think we should do anything else. Whether it’s your first bout of downsizing or you’re a veteran minimalist, living with intention requires you to be mindful in all areas of life, including where you put the things that don’t serve you anymore. Infographic via Trade Machines. See the entire image here - it’s very eyeopening. Americans purchase one article of clothing per week and we keep our clothes for only half as long as we used to 20 years ago. 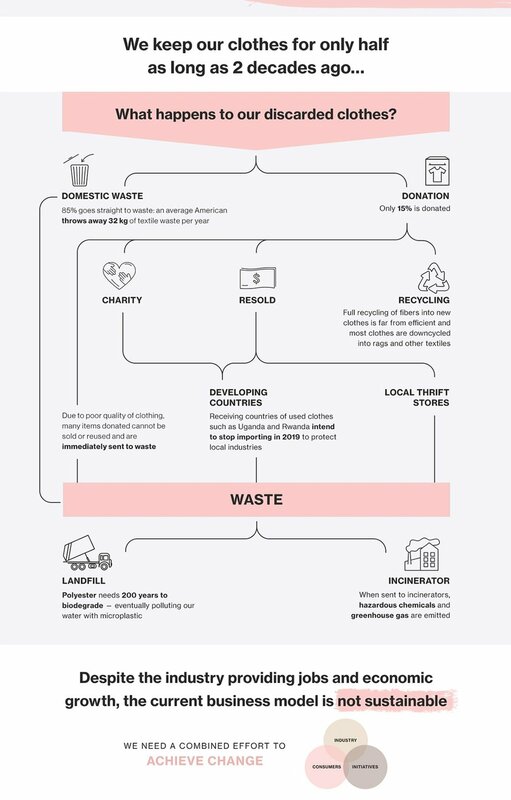 It’s estimated that Americans toss about 70.5 pounds of textile waste into landfills each year, with a measly 15% ever being donated. The pictured infographic is wonderfully helpful for explaining more. Sentimental clutter is one of the hardest areas for most people to purge. The memories associated often seem to attach themselves to the physical item. I’ve never ascribed to the “rule” that you can’t keep any sentimental items, but here are a few rules that I follow when getting rid of anything with sentimental value. Things like spices, mismatched sets, and appliances that you never use all probably fall in the category of “not sparking joy”. Be careful that you don’t lump it all into the trash when, chances are, each item needs individual consideration. For odds and ends that you don’t use and aren’t sure what to do with, there may be a charity or organization that will take it off your hands. Many schools will accept musical instruments, office supplies, or children’s toys. Homeless shelters often take clothes, unused food, and the like. Do some digging into local organizations and send some items their way. The cornerstone of a mindful lifestyle with less clutter (which ultimately means creating less waste), is what you do moving forward. If you purge your belongings only to replace them shortly after with “new and improved” ones, you’ve missed the point. That’s not to say you shouldn’t shop or buy things that do, indeed, spark joy or fill a gap. However, once the initial purge is over, being extra cautious of what you buy/accept/bring in means that you’ll have less clutter and less to worry about downsizing later. Of course, none of us do this perfectly. It’s impossible to exist without creating waste of some sort. However, I hope these tips inspire you to Kon-Mari your life away and dispose of the joyless items responsibly. Did I miss anything? Leave me a comment below and let’s chat more! Think of your life as a garden. For a garden to survive, plants need the basic necessities, such as water, sunlight, and solid rooting. But for each plant to thrive, it needs space and an abundance of nutrients. If you prepare a small garden and pack it full of seeds, none of the plants grow very well. They compete for resources and tear each other down. The same concept applies to your life. When you have too many ‘plants’ in your ‘garden’, they rival each other for your precious time and energy. You end up with unhealthy plants and depleted soil. However, if you were to select specific plants and spread them out in your garden, they will all thrive! Examine the three areas of your life below. You get to choose which plants should stay and which plants aren’t the right fit for your garden. We all have toxic people in our lives. Forcing yourself to interact with those who make you constantly unhappy is a waste of your time and theirs. You could be investing that time into so many different endeavors. Why spend special moments with a person or group that makes you miserable? If you’re feeling guilty about distancing yourself from someone, please consider this. Do you add more value to the world by being around them? If not, there’s a good chance you’re far more irritable and negative after spending time together. It isn’t fair to the people closest to you when you take this negative energy out on them. Human connection is powerful and it should never be taken lightly. Find the friends that mean the most to you and invest in them with your time and energy. There is always a give and take in friendship, but when someone is only taking and never giving, you need to examine your relationship. We all have commitments. Whether these commitments are to people, companies, or organizations, everyone is constantly taking on MORE. The best way I can illustrate this is with my own story. For years I had been a teacher at my church’s Wednesday night program. My schedule was already packed with work and courses I was taking, but I signed up anyway because I had done so in the past. I felt obligated, even though no one was making me do it. The first evening, I had no time to prepare and I was so frazzled that something enjoyable became a very stressful night. At the end of my lesson, I decided I couldn’t teach on Wednesday nights anymore. I felt like a failure for not being able to uphold my commitment, but when I really thought it through, the problem wasn’t letting go; the problem was saying yes in the first place. My initial reaction was that this would just be another plate to spin. If I’d just listened to myself from the start, it would have saved everyone involved a lot of stress. If your commitments are draining you then do what you have to do to let them go. Have those tough conversations, I promise it will all be worth it. And next time someone asks you to make a commitment, big or small, go with your gut on accepting. You don’t owe anyone a yes. We all have bad habits. Most of us are 100% aware of unhealthy habits, yet choose to do nothing about them. Look at your habits and pinpoint the ones that don’t serve you well. Maybe your bad habits are drinking too much, overeating, sleeping in late, binge watching Netflix, or playing mindless games on your phone; these habits have consequences! They STEAL your time and energy. It’s easy to view these as no big deal, but they are the weeds of your garden. You can never get back the hours wasted on silly endeavors, but you can change your habits so that you make the most of the time you have left. I recommend replacing these bad habits with new, better, and healthier ones. Maybe you start getting out of bed as soon as your alarm goes off. Maybe you strive to do at least 5 minutes of exercise every day. A small step in the right direction is all it takes to get your positive momentum going. Removing weeds from your garden will leave you with so much extra time and energy. Now, the key is to say NO to the things that you don’t want in your life. Take that free time and start doing the things you’ve been wanting to do for yourself! Take up a new hobby, learn a new skill, or just have some nice alone time. Getting rid of "stuff," and downsizing my wardrobe has been huge for my own journey, but I think that more often than not, the term "minimalism" focuses too purely on stuff, and not on deeper issues like ethics and lifestyle. And since I'm all about getting at the heart of things here on SL&Co, I've been gravitating towards "the slow" and away from "the minimal" for a long time now — both publicly and in my own home and heart. While I still consider myself an "aspiring minimalist" who loves all things white-washed and capsuled, I'm growing into my newly made habits of shopping with intention, considering my schedule, and prioritizing self-care, and find the term "slow" much more fitting for where I'm currently at.